If you need help finding an exhibit, ask an orange-vested Explainer. Step right up and get something spinning. The experimental possibilities are endless. Try spinning a disk on its edge, or rolling one onto the table. Can you get one to spin in place? This exhibit makes a great meeting spot, for good reason: It’s so hypnotizing that you won’t mind—or even notice—if you’ve been kept waiting. 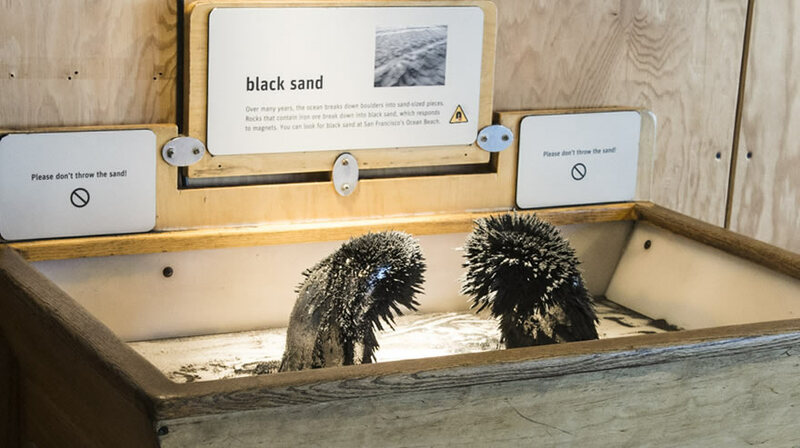 The black sand at this exhibit is a naturally occurring magnetic mineral called magnetite. Try cupping some sand in your palm. Does your hand alter the magnetism? 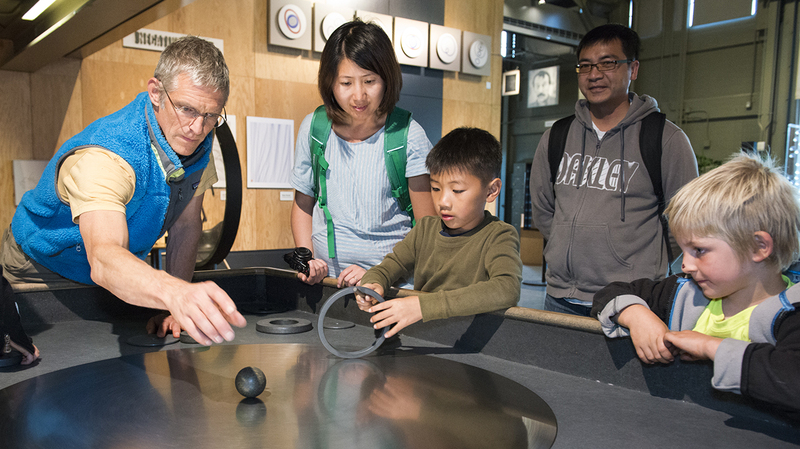 What happens as you bring your hand closer to or farther from the exhibit? We collect black sand at local beaches, and you can too: Next time you visit a beach near San Francisco, put a magnet inside a plastic sandwich bag, put the bag on your hand like a glove, and sweep your bagged hand through the sand. You’ll have a bag full of black sand in no time. Can you see the wiggles in a plucked string? Ordinarily, vibrations this fast are too fast to see, but the bright white lines moving behind the strings create a visible scan, sort of like a strobe light. The fast waves you see are high-pitched sounds, while the slow waves are low-pitched sounds. 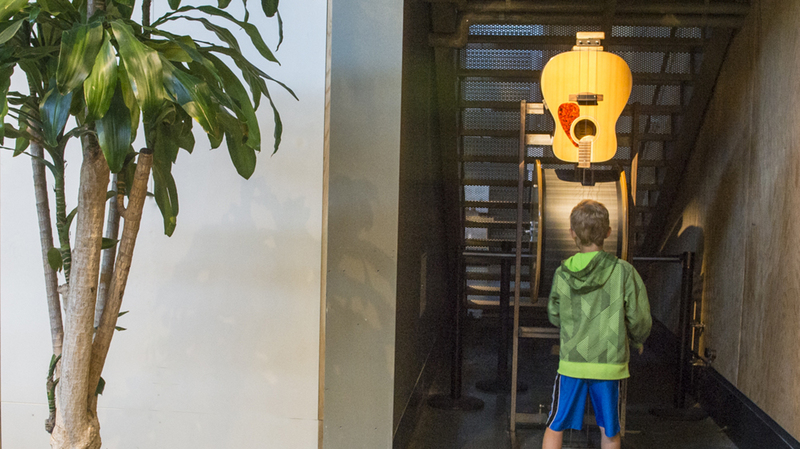 Try stepping on the pedal as you strum the strings for an extra groovy sound. 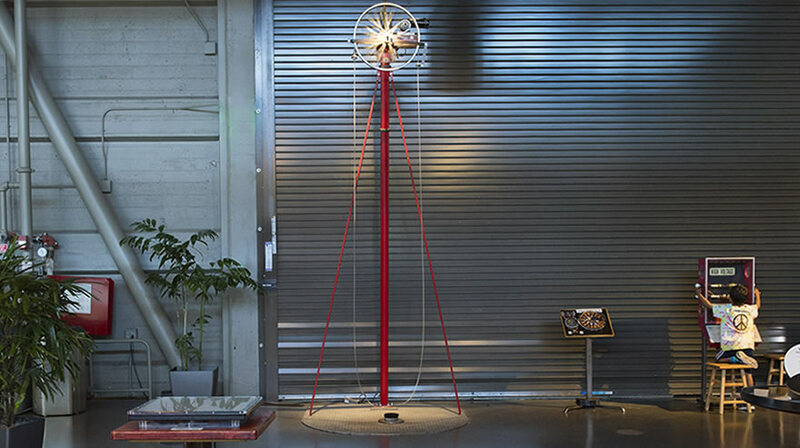 Touch this moving loop of chain and you’ll make waves that act decidedly strange. Try lightly tapping the chain on the left side and watch the waves, then try tapping the chain on the right side. Do you notice any differences? Waves that travel with the motion of the moving chain quickly whip up and away. But waves that travel against the motion of the chain seem to hover and dance eerily in place. 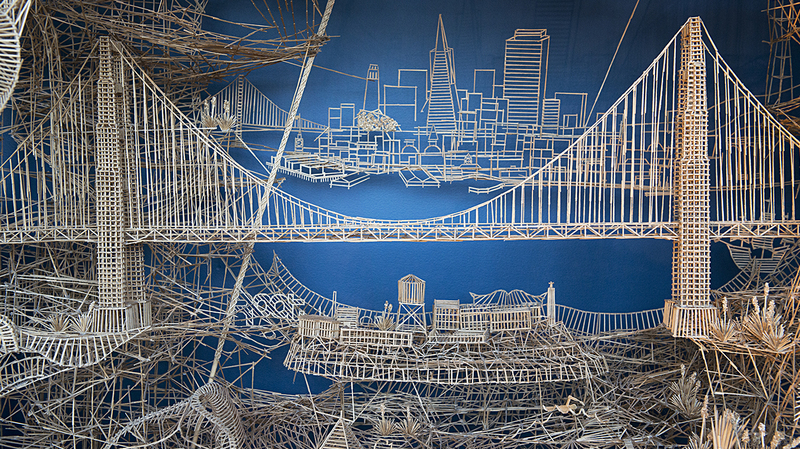 Artist Scott Weaver spent over 40 years building this astounding sculpture—can you guess how many toothpicks are in it? If someone happens to be staffing this exhibit, ask them to start a Ping-Pong ball rolling through one of the 15 different entrance points. If you’re really lucky, you may meet Scott himself; he comes here often to continue adding to his creation! Be the first to know what's happening when.